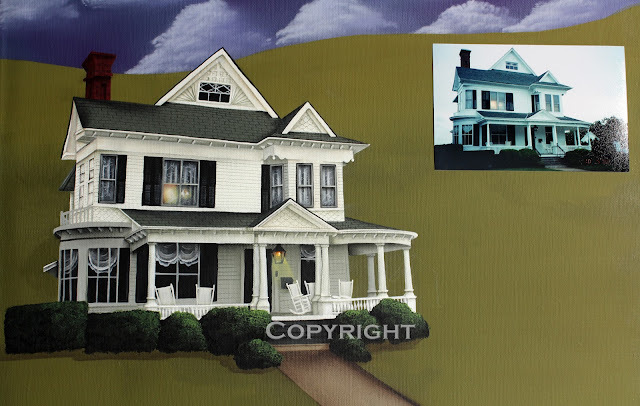 Today I finished the first floor of the house adding curtains in the windows, rockers on the porch as well as the porch railings. Bushes and a sidewalk were also painted and pumpkins and autumn leaves will be added once the surrounding area of the landscape is painted. Below are more autumn prints that are available in my Etsy store at 15% off when you use the code BLOGREADER11 at checkout. I would love it if you would subscribe to my blog in the righthand column on Linky or Google Friend Connect, but it's not necessary. Just use the discount code and you will get a discount on your entire purchase each time you visit my store. 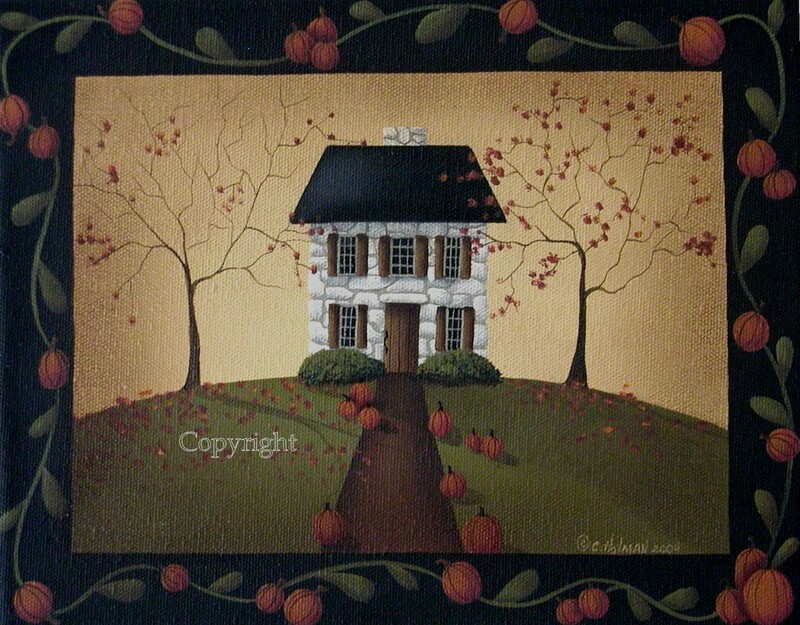 I'll be back with more details added to the new autumn folk art painting. I also need to start thinking of a title and if anyone has any ideas, please share in the comment section. 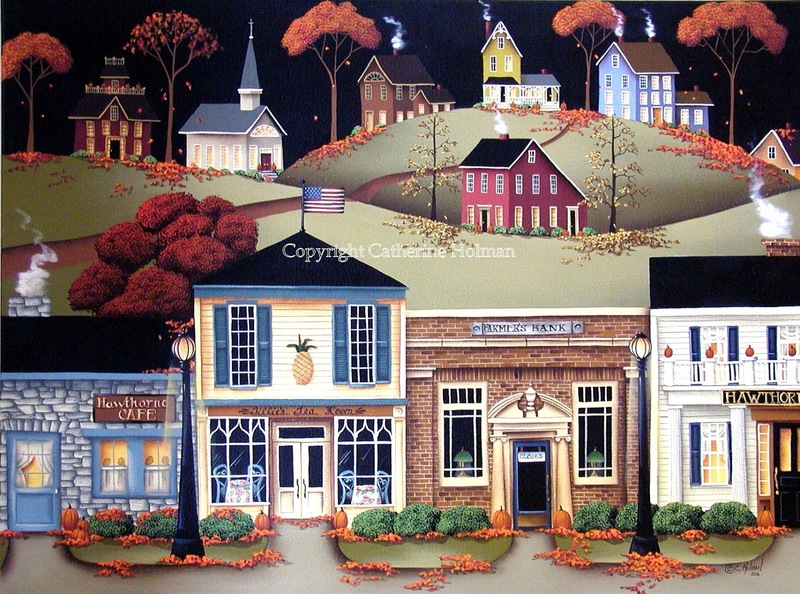 Hope you are having some wonderful fall weather wherever you are! I've got to get someone with a credit card here before the weekend ends! ☺ I love them all and how darling the house with its lovely lace curtains. I love painting the details in these types of portraits ... it's like you become a little person and step inside the world you created on canvas :) Again, Cathie ... STUNNING WORK! Always makes me want to pack up my things and move right into one of your charming villages. 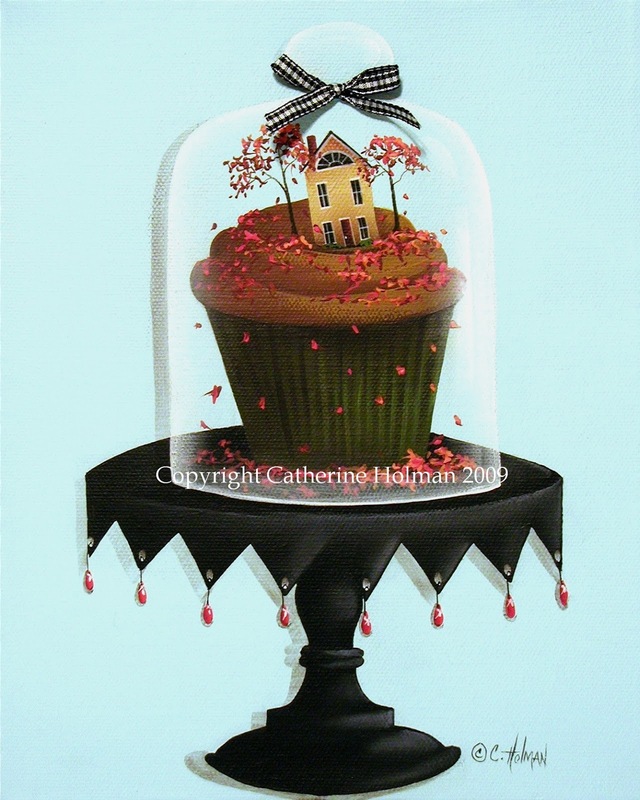 Cathie, all these painting of your are marvelous!!! 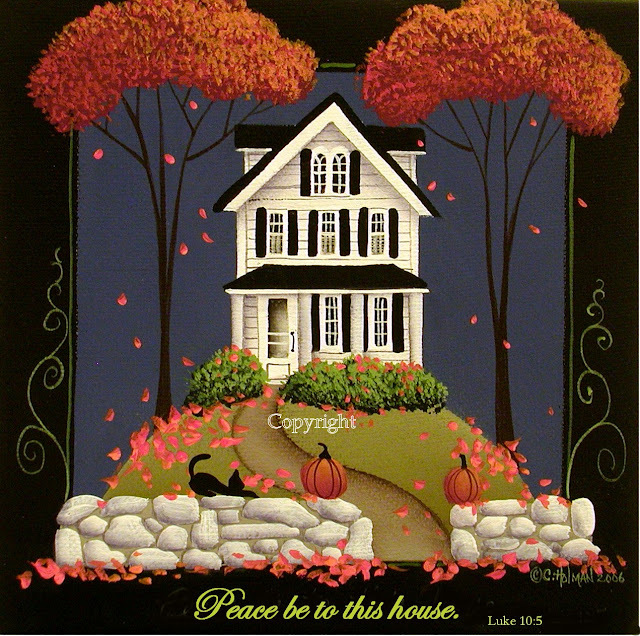 I love the first one with the rocking chairs on the front porch-just wonderful!! I can't wait to get in the new house so I can put your 2 prints up that I bought from you awhile ago!!! Have a great weekend! Your house painting is a masterpiece1 Love it! Hi Catherine, I love all these pieces. Especially perhaps the cat with the pumpkins. Love your rocking chairs as well in the first painting. What awesome paintings. Am loving them all. Phantastic, your houses are great. I would like to life in all of them.